Foliage plants for containers add color, form and texture to your container garden designs. Many are easy to grow and maintain, and most overwinter well. Ornamental grasses are also foliage plants and many grow very well in container gardens. When you’re planting in the shade and using lots of foliage plants, try bright or metallic containers. They will reflect light better and create some contrast. Hostas are one of my favorite foliage plants for containers – definitely my “go to” in shady areas but I have several that have done well in the sun too. I had so much trouble with ground moles eating my hostas, but container gardening has taken care of that. 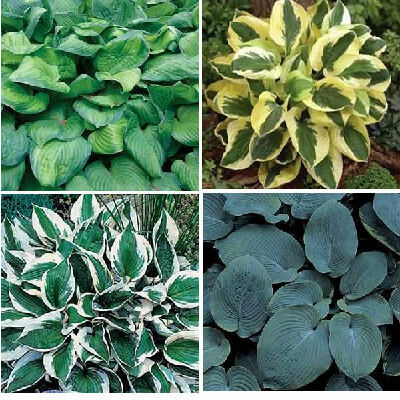 Hostas are valued for their foliage, and they come in so many varieties – colors that range from whites and pale greens to dark greens and blues. They also come in small and large leaf types and their leaves range from crinkly to smooth in texture. Hostas look nice all season. Here are four to consider – clockwise, starting at top left – guacamole, brim cup, elegans and patriot. Mix blooming plants among your hostas – they look great in groupings and are a good choice for shady porches, decks or patios. Hostas are one of my favorite foliage plants.They are perennial and grow in shady areas and also in partial sun. There are many varieties an colors – they add great color and texture. Learn more about hostas here. Container gardens consisting mainly of foliage plants need a mixture of those plants to create interest. Choose plants with different textures and colors. Some foliage plants also flower at some point – when they’re done flowering, just remove the stem or stick and enjoy the foliage for the rest of the season. Mix annuals or other perennials with your foliage plants for color and interest during the blooming seasons. Plants with dark foliage highlight pale colored flowers, while white, silver or pale green foliage looks great with dark flowers like purple pansies. A few foliage perennial plants that do well in containers in the sun are below, left to right: artemisia, lilyturf and lamb’s ear. Plant breeders are always looking for new varieties to meet gardeners needs and wants. Metallic colored foliage has been a trend – developing foliage in colors of silver, bronze or gold. They are nice for bringing light to dark, shady areas of your outdoor areas. Coral bells, coleus, new Zealand flax, and trailing verbena come in these shades. In addition to hostas, coral bells, lungwort, and ajuga below, left to right do well in shade. Heuchera, or coral bells, are another great foliage plant. They come in a huge array of colors and are so easy to grow. You will love them. Learn more about coral bells here. When it comes to foliage plants for containers, don’t forget ferns. There are over 12,000 varieites in all shapes and sizes. Many work well in container gardens, either as single plantings in a container of their own, or mixed with other plants. 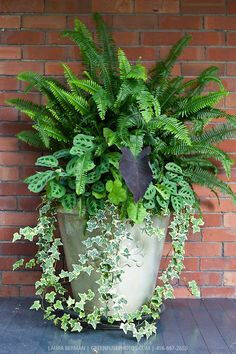 Ferns are a foliage plant you may overlook for container gardens. There are thousands of varieties. 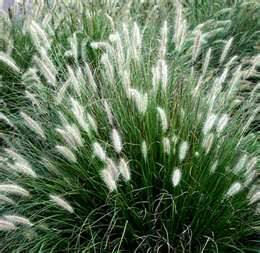 Other great foliage plants for containers are ornamental grasses. They are ideal for adding height to the center of a container garden and they are great plants for privacy. 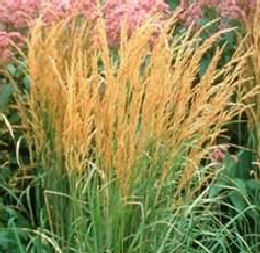 Ornamental grasses are drought resistant plants that can withstand heat and wind. Because they can grow pretty tall, you may need to weigh their container down with a little gravel, or secure it to a railing on a balcony. The best thing is to choose one whose mature height is not so tall that it will cause the container to tip over in wind. Fountain grass does very well in containers. It has leaves and flowers which change color with the seasons, and lasts well into winter. They thrive in full sun and moist soil, but good drainage is a must. Choose a dwarf type so they don’t get too tall. I especially like “Little Bunny” shown above. Feather reed grass (to the right) has a narrow, upright growth habit. It reaches 5 feet in height and likes full sun. Blooming in summer, its panicles add winter interest to container gardens as well. Bluestem grass once covered the prairies of the US. It will grow 4 to 6 feet in containers. It has a silvery blue foliage, and in fall, its stems turn a copper color. It is very nice and likes full sun. Sedge, tussock grass, ornamental fescue (blue is nice) and Japanese hakone grass.